Pathological Q waves are more than 1mm wide (40 msec), 2mm tall, more than 1/4 of the QRS height. They are associated with myocardial infarction, old or current. Anterior STEMI and multiform PVCs with Narrow Coupling Interval. When to give beta blockers in acute MI? This ECG is from a middle aged man presented with 45 minutes of chest discomfort on a background of hyperlipidemia. This was his initial ECG. This ECG is from a middle aged man presented with 45 minutes of chest discomfort on a background of hyperlipidemia. This was his repeat ECG 24h later, after stenting of an LAD occlusion. This ECG is from a middle aged man presented with 45 minutes of chest discomfort on a background of hyperlipidemia. This was his repeat ECG 48h later, after stenting of an LAD occlusion. This ECG is from a middle aged man presented with tachycardia, leg oedema and a raised JVP. This was his repeat ECG the next day after cardioversion and catheterisation. This ECG is from a man in his 60s who presented with central chest pain that started while mowing the lawn, associated with diaphoresis, nausea and vomiting, on a background of hypertension and previous infarction. This was his repeat ECG after intervention. Instructors’ Collection ECG: Right Bundle Branch Block With Probable Previous M.I. 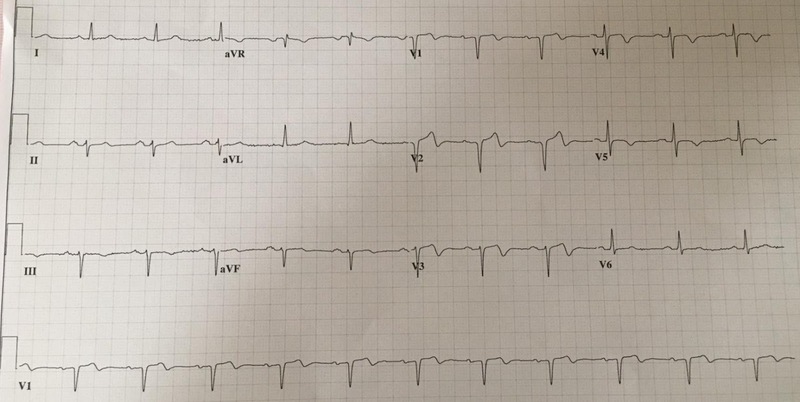 This ECG is from an 87 year old man who presented with chest discomfort. This ECG is from a middle aged man who presented after a single vehicle motor vehicle accident with significant energy. On arrival he was hypotensive.